Apple/Verizon rumor mill; will the Hub be replaced by the Apple media pad? On the heels of USA Today's updated article about Apple's discussions with Verizon; Business Week reported yesterday that Apple is considering an iPhone Lite and some type of media pad targeted for Verizon. The iPhone Lite, a smaller and thinner iPhone has been reported before and there has been rampant speculation about a netbook type device, although it is clear that Apple wants to create a new category of product. The media pad would let users listen to music, view photos, and watch high-definition videos, a well as make calls via WiFi. I have been reviewing the Hub and will be publishing my results later this week on pocketnow.com. My home wireless network configuration has two Linksys WRT54G-TMO routers (one upstairs and one downstairs) wired into a D-Link DFL-210 router connected to Verizon's FIOS network. I set them up to operate as Access Points using the bridge option, turning off the firewall and DHCP options. I use the same SSID on both routers for seamless roaming all over the house. 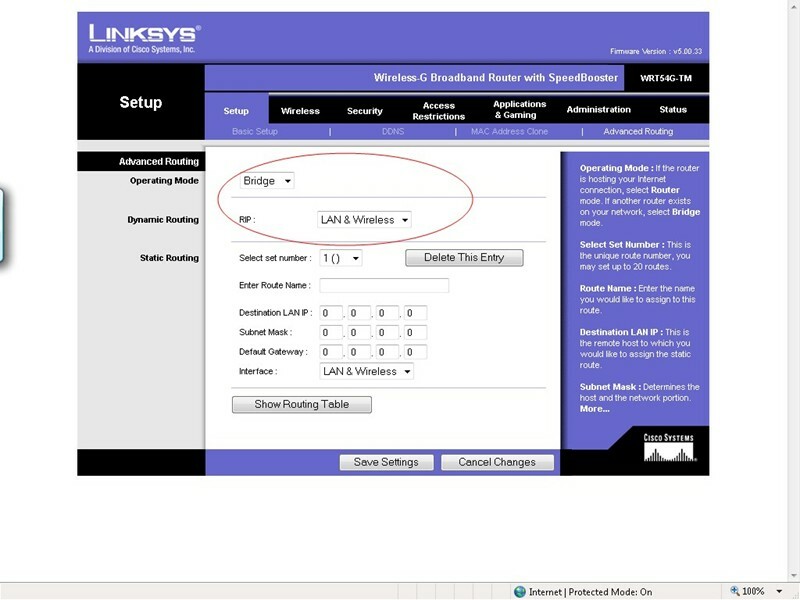 Under the Basic Setup screen/Internet Setup you need to switch to Static IP and enter a dummy IP address. Under Network Setup you need to enter a Static IP address on your network and disable DHCP Server (this static ip address will become the router's IP address). You then need to plug the cable from your wired router into one of the LAN ports. In this configuration you do not use the WAN port. Under the Advanced Settings you need to set the Operating Mode to Bridge and the Dynamic Routing to LAN & Wireless. Under the Security tab you need to disable the Firewall Protection. The Firewall won't work since there you are not using the WAN port. I looks the company behind the UMA software used by T-Mobile and BT is called Kineto. Wireless. 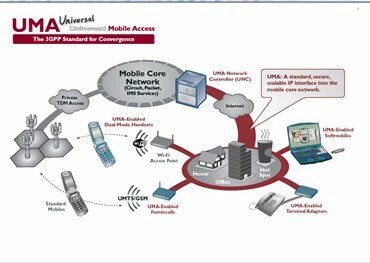 Here is a diagram (courtesy of Kineto Wireless) depicting how UMA works. The Kineto Wireless UMA diagram (link to larger diagram). Last week I received a promotional email from T-Mobile which is currently offering the service for $9.99 a month or $19.99 for a family plan. This is a great deal. I have always viewed this technology as the holy grail of telephony convergence; one phone, one number and cheap VOIP calls. I had to try it. Currently, T-Mobile has two UMA compatible phones. 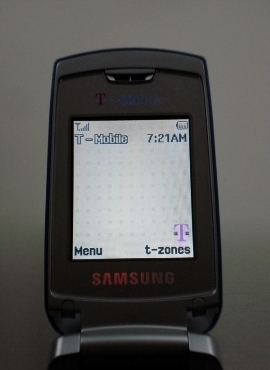 the Nokia 6086 and Samsung t409. Both range from $49.99 to $179.99 based on contract terms. Although you can use your own home router, T-Mobile provides two routers (D-Link and Linksys) with enhanced UMA functionality. They are currently free with a $50 mail in rebate. I opted for the Samsung t409 which is tri band vs the Nokia quad band, but I have heard that the Samsung pulls in a stronger signals. I also chose the Linksys WRT54G-TM router even though I already own Linksys Access Points (for free you can't pass it up). For novice users the setup is actually very simple. A wizard on your PC will setup the router and a wizard on the phone will setup the WIFI link to the router. Once the WIFI link is setup it works magically. I made a call in my family room using WIFI, walked out to the back of my yard, the call was handed off to the cell network seamlessly. The technology is amazing and it works. Everybody is buzzing about the innovation of the iPhone, but I think this technology has the opportunity to revolutionize the way we use cell phones. Today, only a fragment of the population use cell phones as their primary phone. UMA can change that, this is the true beginning of the death of the Plain Old Telephone System (POTS or land line). I think this is a great play for T-Mobile. As a $9.99 add on it allows them to compete head on with the Triple play bundling ($33 x 3 phone, cable, internet) from the cable and phone companies. 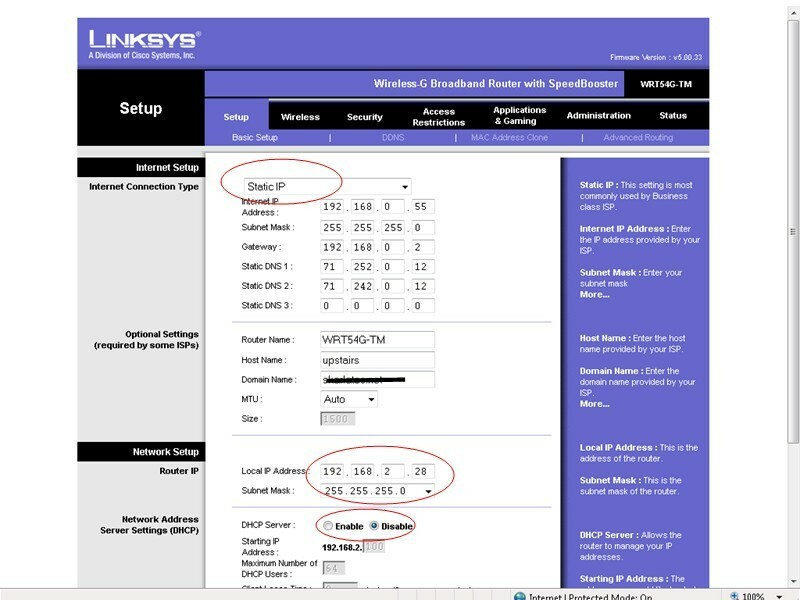 On the router front, I tried both my Linksys Access Point and the Linksys/T-Mobile Router. The sound quality on the Linksys/T-Mobile Router is noticeably better, so I replaced one of my Access Point for the router. In the upper left hand corner of the display, a blue dot with red signal strength bars along with the SSID name of the WIFI network are displayed to let you know that you are connected via [email protected] The default WIFI SSID network name is @HomeXXXX, XXXX are the four last hexadecimal numbers in the router's MAC address. I changed it to match the SSID I use with my other Access Points (AP) around the house. The phone does not seem to want to roam from router to AP, so I may have to purchase another Linksys/T-Mobile router to ensure I have adequate coverage throughout the entire house. I also turned off the firewall and DHCP on the router, since my D-Link DFL-210 performs those functions. 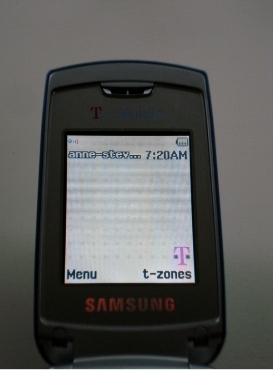 The cellular signal strength along with the carrier is displayed when you are connected to the cellular network. The family has now used the phone for 2 and 1/2 days and 81 minutes. Everyone is impressed with the sound quality. My wife is even thinking of dumping her Razor for the flexibility of using one phone. She currently uses our Sunrocket VOIP line to make outgoing calls from home to save our minutes. The only thing that is missing is a VOIP adapter that would allow us to use the telephone sets around the house...With Bluetooth we could use our Phone Labs Dock-N-Talk, however it is an early version and the sound quality is just ok. Phonelabs has upgraded their firmware, I will check to see if I can get an upgrade.